Since people I know in real life read this blog (or at least humor me by saying they do when I tug on their sleeves), I will not admit to being familiar with "Jon & Kate Plus 8". However, if I had ever watched that show late at night when I couldn't sleep and my God it's fascinating hoooo boy what with all the sippy cups and the chaos and the nervous breakdowns peeking over the horizon... anyway... when I got an e-mail from steph saying this was their house, I might've been particularly happy about seeing the listing. But it's driving me absolutely nuts that I can't read these notes. I can tell that the notes are Bible verses. What? Time to read with 8 kids? And how clean is that listing? Nicest thing I've ever seen on here. I'm a little sad in my heart. The notes are probably Bible verses. Third one down is definitely Proverbs 3:5. I'd bet the rest are similar. I was coming here to give that link to you! I think they are Bible verses. Not that I watch the show just to scream at Kate about how awful she is the whole time or anything. OK, I think it's creepy that there's a note posted on the window that appears in the mirror but it is not on the window in the real dimension. I think that only happens when ghosts are involved? I just know that one of them says "Create Visualization Board". Bra *then* shirt? Oh man, I knew I was doing something wrong. If this really is that house, then at least one of them is a Bible verse. I totally recognize that kitchen, and I clearly remember my mom and I trying to read the verses during one episode. I mean, she was trying to read them. Because she watches it. I just happened to be on the same couch... looking at the same screen... Total coincidence. I agree with Jacqui- third one down is Proverbs 3:5. I can't figure out any of the rest though. . .
so totally jon & kate's house. i'm slightly ashamed to admit how addicted i am to that show. I watch the show. They are bible verses. But I wonder why they'd leave the bible verses up for the realtor photos, but remove their dining table. I think she does incredibly well for a person with 8 kids. A controlling person with 8 kids! I'd need bible verses tattooed on the insides of my eyelids if I had 8 kids, that's for sure! She has mentioned on her show before that they have Bible Verses throughout the home. The listing doesnt mentuion how much sq. ft. teh house is though. And at least they took down the stage lighting. That is so their house! And it's SO weird to see it listed like that! You can actually feel the whole building breathing a sigh of relief -- finally, some peace and quiet! I called in my sister--the World's Biggest J&KP8 Fan Under 12--and she is positive they are Bible verses, too. On the occasions I've seen the show, the kitchen cabinetry also has verses on it. I got really excited when I first saw this picture. Before reading the commentary, I thought it was a Passive Aggressive Notes cross-over post. It still is in my mind. 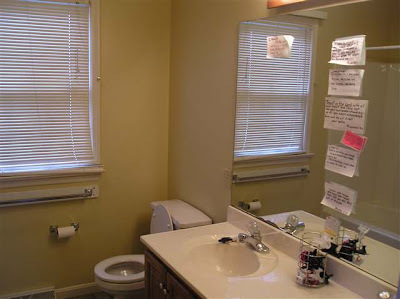 Why the heck would the realtor not remove those notes? Are they using the "celebrity" factor here? "House comes complete with Kate's sticky notes!" Two pics of the laundry room and none of the front of the house. GWOP bloggers saying the asking price is way too high for the area. My only question is how are they going to pay for all that therapy in a few years? Freud: So you say you were followed by a camera crew everywhere you went as a child. How did that make you feel. One of the Eight: -sob- It felt wonderful! And now no one pays any attention to me and my own mother can't remember which one I am. I had my fifteen minutes of fame too early! Another of the Eight: -sob- My life was ruined! Everyone I meet says, "Oh you were the one with the pacifier addiction." They all think -hic- I have -hic- an addiction -hic- problem. The listing says "brick". It doesn't look like brick on my computer. Maybe it's brick under the wood siding? Wow, I am surprised at all the negativity about Jon and Kate. I think they are pretty awesome parents. Yes, Kate tends to yell. I do think they love their children and are providing some wonderful experiences for them. I find it interesting that some here could make comments about them needing therapy and admit to never watching the show. As I began, wow. Yes, lots of judging...how many people who are negative towards Kate actually have 8 children, not to mention twins & sextuplets. Cut her some slack she probably gets like 2 hours of sleep a night. The house is nice, btw. Some family staples have been left behind...a little starbucks and a gallon of bleach. I have seen mere seconds of the show here and there...I found it painfully boring. I have 3 little kids. Yes, it'd be hard having 8, but I don't want to experience it all with Jon and Kate. I think a "celebrity" house deserved professional photography, though. I love your notes! Though I agree they could be Bible verse it's more fun to think of what else... maybe notes to themselves about what to say in front of the cameras? * "Drat", "Oh Fudge," "Phooey," "Shoot." * Try not to yell when red light on camera is blinking." Nothing in the listing about it being seen on TV by millions of people? In the interest of full disclosure, seems like it mention that half of America knows the house's whole floorplan, huh? Let's not speculate about the race, class, or parenting skills of the people who live in these houses. We judge them on the photos they pick, not on who they are as people (unless we really can't help it). Fair enough, Paula71. I deleted a whole stack o' mean comments, but I could've pruned more carefully. I do try to keep in mind that the homeowners may well see the listings -- I know its happened with some of them -- and I don't want to make anyone sad. "- OUR KIDS NAMES ARE: CARA, ALEXIS, COLIN, HUNTER, GATHERER, MANNY, MO, JACK"
Oh, I'm going to be chuckling about that for a long time. And it will be way too hard to explain to the people who look at me funny.